Samford University’s Beeson Divinity School conferred degrees to 14 students — seven who received a Master of Divinity degree and seven who received a Doctor of Ministry degree — during its winter commencement and service of consecration Dec. 2. Samford President Andrew Westmoreland welcomed the graduates and their families to Beeson Divinity School’s commencement, which stands in a 174-year tradition of Samford graduating students for gospel ministry. Divinity dean Timothy George acknowledged that this occasion was the combination of two important events — commencement and consecration. George also announced that the school will give a Bible in each of the graduates’ honor to a divinity alumnus to help further his gospel ministry in Nepal. 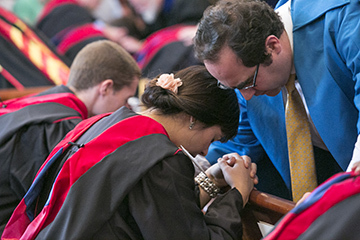 Following a longstanding school tradition, each faculty member prayed individually for each graduating student during the consecration ceremony. William J. Carl III, senior pastor of Independent Presbyterian Church in Birmingham, preached the commencement sermon entitled “You’re Somebody!” Carl is pastor of the church where Beeson Divinity School’s benefactor Ralph Waldo Beeson was a member. Preaching from 2 Corinthians 11 and 12, Carl told the graduates that if they want to be somebody, they must first recognize they are nobody without the grace of God. “The moment you think you’re somebody because of your own doing, God is going to take you down a notch or two and put you in your place,” he said. “God rarely works with the ones who think they are somebodies. “You are not somebody because of your own doing but by the grace of God,” Carl continued. “The moment you feel most like a nobody is the moment you can become the somebody God really wants you to be. “You and you and you — every single one of you — you are really somebody by the grace of Almighty God,” he concluded.